Pandora's Box, in patriarchal mythology, was the container of all evils, unleashed on mankind by the greatest evil of all – the first woman. Woman was sent to man as a punishment for the theft of fire from the gods by Prometheus. However, the name Pandora originally means "Giver of all gifts", and was a name of the divine maya, the all-creative and all-giving aspect of Our Mother God. 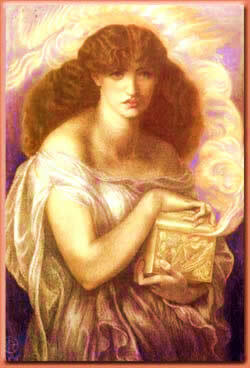 The classical legend of Pandora's Box is thus one of the most extreme examples of patriarchal "mythic inversion". Our Pandora's box is named after the original. It is a cornucopia of many different things – often things that have appeared in the Chapel Chronicle (which can only contain fifty items at a time) and are too good to lose. Also this is a place for discussions and other items that do not fit elsewhere into the site. Nausicaa of the Valley of the Wind: An Allegory of God the Daughter – A Filianic interpretation of the popular anime. Is there Life after Death? – What is the soul? And is it immortal? A scriptural perspective. Blue for Girls, Pink for Boys? – This article looks at a very modern myth as it relates to the symbolism of colour. What's Wrong With Wicca? – A correspondent's question about this modern "Goddess" religion is answered in full. A Sermon in Outer Space – This seemingly rather whimsical science-fiction-based sermon actually answers some very important questions on the understanding of traditional spirituality in a modern scientific environment. St Cecilia: music and blindness, vision and justice – A discussion of St Cecilia in the light of Sai Thamë, Saraswati, Themis and Justitia. The Ten Thousand Things – A very appropriate subject for Pandora's Box. "The Ten Thousand Things" is the Chinese term for all the multiplicity of creation. But why ten thousand? Is this a Chinese eccentricity, or has it a profound and universal metaphysical significance? Read and discover! New Age Thought: Science, Spirituality and Screwdrivers – New Age thought often melds traditional wisdom with the findings of modern science. Is this a valid approach? If not, why not? Original Sin – What do worshippers of Our Mother God think of this key Christian doctrine? The Meaning of Nativity – The Birth of God the Daughter is the central Event of the Filianic Midwinter High Festival. Read about it here. Winter Solstice Celebrations – As winter draws nigh, we examine the true nature of winter solstice celebrations and what they mean to a devotee of Our Mother God. The Origins of Consciousness – Julian Jaynes's theory of the bicameral mind discussed in relation to feminine prehistory. Lux Madriana and the Filianic Scriptures – Clearing up some common misconceptions about the origins of our Scriptures. The Christmas Tree: History, Meaning and Symbolism – a look at the history of the Christmas tree and its origins as a symbol of devotion to Our Mother God. The Feast of the Epiphany of Our Lady – Twelve Days after the Nativity, the Holy Daughter is shown forth to the world. The Feast of the Epiphany long predates Christianity. Learn about its beautiful meaning.